Magic Star in Kissimmee is a holiday home with 1 room. Offering an outdoor swimming pool and a fitness centre, Magic Star is situated in Champion Gates in Davenport, 15 minutes from Disney World. The property has pool and garden views, plus is 17 km from 192 Flea Market. The air-conditioned holiday home is composed of 6 separate bedrooms, a living room, a fully equipped kitchen, and 6 bathrooms. A flat-screen TV with satellite channels is featured. The holiday home offers a children's playground. Guests can relax in the garden at the property. Kissi...mmee Sports Arena & Rodeo is 17 km from Magic Star. The nearest airport is Orlando International Airport, 36 km from the accommodation. 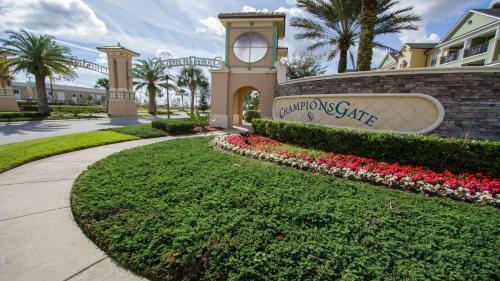 Offering an outdoor swimming pool and a fitness centre, Magic Star is situated in Champion Gates in Davenport, 15 minutes from Disney World. The prope...rty has pool and garden views, plus is 17 km from 192 Flea Market. The air-conditioned holiday home is composed of 6 separate bedrooms, a living room, a fully equipped kitchen, and 6 bathrooms. A flat-screen TV with satellite channels is featured. The holiday home offers a children's playground. Guests can relax in the garden at the property. Kissimmee Sports Arena & Rodeo is 17 km from Magic Star. The nearest airport is Orlando International Airport, 36 km from the accommodation. When would you like to stay at Magic Star? Children and extra beds All children under 6 years are charged USD 13 per night for extra beds. All further older children or adults are charged USD 13 per night for extra beds. The maximum number of extra beds in a room is 1. Supplements are not calculated automatically in the total costs and will have to be paid for separately when checking out. Any type of extra bed or child's cot/crib is upon request and needs to be confirmed by the innkeeper. Guests are required to show a photo identification and credit card upon check-in. Please note that all Special Requests are subject to availability and additional charges may apply. Please inform Magic Star in advance of your expected arrival time. You can use the Special Requests box when booking, or contact the property directly with the contact details provided in your confirmation. This property will not accommodate hen, stag or similar parties. Please note that all Special Requests such a heater pool is subject to availabilityand additional charges may apply. Please note that decor and design may vary. Contact property for details. Please note extra beds and baby cribs are available for a fee. Contact property in advance for price information and to make arrangements. All Vacation Dreams will contact guest after booking with payment instructions. Contact property for details.